Founded in 2000 by the World Heart Federation, World Heart Day is the world’s biggest cardiovascular disease awareness-raising platform. Every September 29th, the celebration informs millions of people around the globe about ways to improve their heart health. To spread our message, we launched the World Heart Day Thunderclap to make some noise for heart attack and stroke prevention. The World Heart Day Thunderclap campaign was support by 166 individuals and organizations that boosted a social reach of over 1.6 million. 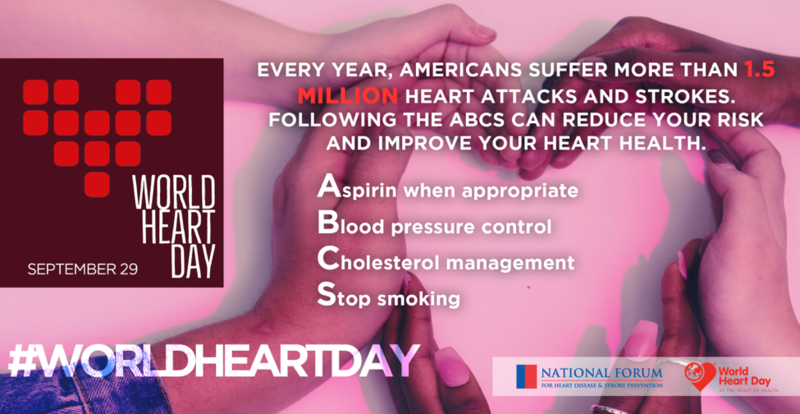 Thank you to everyone who helped raise awareness about tackling heart attack and stroke as part of our drive to reduce premature deaths from cardiovascular disease including our partners: the World Heart Federation, the mayors of seven American cities, CardioSmart, Amgen and AstraZeneca. Why celebrate World Heart Day with Us? Many people who are at high risk for heart attack or stroke don’t know it. The good news is that prevent and control these risks. Aspirin can reduce your risk of having a heart attack or stroke. High blood pressure is the leading cause of heart attack and stroke in the United States. People with high cholesterol are 5x more likely to have cardiovascular disease than those with lower levels. WE ARE GRATEFUL TO THE 2017 SPONSORS OF WORLD HEART DAY IN THE U.S.